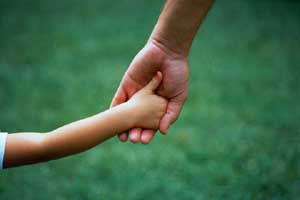 Have you heard the diabetic-coma inducing sweet phrase: A mother holds her child's hand for awhile, his heart forever? It one of those phrases you see around Mother's Day on greeting cards. Moms whose little ones have grown up will say it may be trite, but it is still true. Sadly, I feel like my "awhile" is quickly running out. I'm entering the time when my kids don't want to hold hands any more. We've required them to hold our hands when crossing the street or in a parking lot, or just plain 100% of the time we lived in the busy metropolis of Hong Kong. The rest of the time, I could reach out to hold a hand and they'd willingly place theirs in mine. Nathan, who turns 8 in two weeks, no longer goes for this. In fact, even when walking him home from school in the crosswalk, he'll say "Mom, I'll just put my hand on your arm". Of course, all his school mates are watching and their parents don't have the same rule evidently, so that has something to do with it. Ben at age 5 on the other hand, still willingly holds my hand, and frequently reaches up on his own to hold mine. We had a few weeks of warm October weather, but despite the hot air and sweaty palms, I never once let go of Ben's little hand as we strolled the entire 1/2 mile walk to his school. But this morning on the way to school Ben started out holding my hand and then looked up and said "why are we holding hands? We're not crossing the street?" I said that sometimes it's just a nice thing to do. He laughed, let go of my hand, and ran to catch up with his big brother. Another trite, but true saying: They grow up so fast.